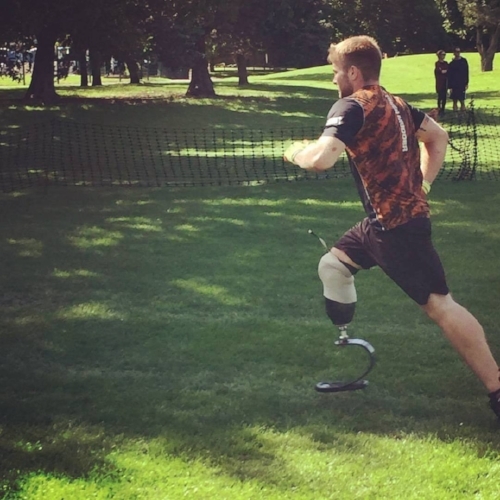 As you can imagine, running on a blade is a lot springier than running on a standard prosthetic foot. As with any prosthetic, the amount of energy you put in is returned through the foot e.g. the harder you step, the springier it is. Because of the shape of the blade, it allows the user to gain more of a return per step, which acts as a huge advantage for the level of energy required to run. With a standard prosthetic, the foot does not propel your leg forward however with a running blade, it does. When running, individuals depend on their toes to push them forward however without toes, this is often difficult - the running blade's spring-ability helps to act as toes to keep you running faster and further. The weight of a running blade is far lighter than the weight of a standard foot. Many blades do not require a shoe to be fitted so you immediately save weight. Furthermore, blades are specifically designed to be lightweight to reduce the strain on your amputated side. As my Blade XT sticks slightly out the back, it can take a while to get used to the different size however this is a common story with running blades due to their curved design. Running down steps can be difficult with the change of size however actually running down them is easier due to the 'spring in your step.' Running up steps on the other-hand is much easier since the spring propels you up the steps and it's a lot more comfortable to bounce around in general. Without the weight of a shoe, it's also a lot easier for running through water - as long as your blade is waterproof (which mine is)! With a standard prosthetic, it is designed so the pressures of walking are applied evenly throughout your stump. However, when running, it is often found that a lot of pressure is placed in uncomfortable areas so the faster you run, the more impact your stump takes. With a running blade, due to the spring, the impact is reduced and you feel it far less. Furthermore, a running blade socket is designed differently for these different pressures. Running blades are typically a few centimetres longer than a standard prosthetic leg. This is to take into account the impact of running. Sprinting blades are often taller as the impact is higher and the blade compresses more. Ideally, the blade will compress to the same level as your sound leg, to reduce the strain on your joints and allow for an even running pattern. People often find it very difficult to walk on a running blade - hence why I love my Blade XT. The heal component allows for both running and walking! A running blade is designed to mimic running....funnily enough! When learning to use a prosthetic leg, you are taught to walk 'heel to toe,' and prosthetics are built this way however with running, this is not the case. The curved running blade is designed to copy an ideal running style and this generally means not running heel to toe. The lack of weight also allows you to bring through the running blade, allowing for quicker running. As you may know, I have my Blade XT, which is incredible for running. I know i'd be lost without it.